New for SS10, Gloria Vanderbilt introduces its cropped stretch jean, as worn originally by Kate Moss. Available in a variety of fresh pastel colours, the jeans provide comfort and summer glamour to flatter all figures. status and was worn by models, actresses, singers and royalty including Debbie Harry, Helena Christensen, Kate Moss and Giselle. 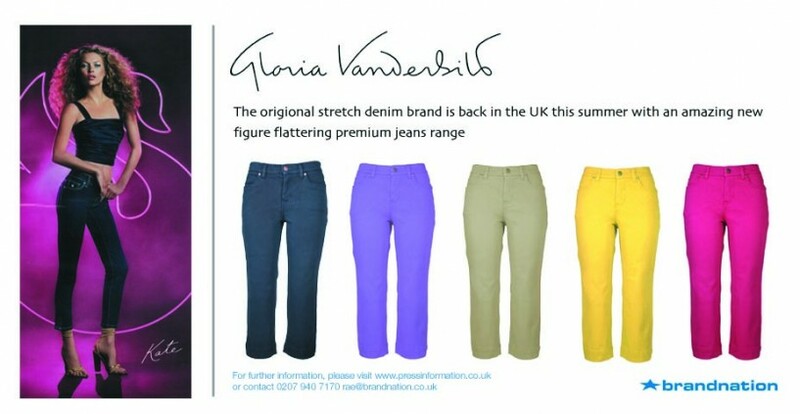 Now Gloria Vanderbilt is back in the UK – re-launched with a brand new premium stretch denim range designed to appeal to women in the 2010’s in the same way the original was designed to appeal to 1980’s women. The brand ethos is the same – classy, quality denim wear that keeps all the curves comfortably, stylishly and effortlessly in the right place, however the designs and the technology that supports them have been totally revised to provide the most effective figure flattering package there is. UK women can beat the bulge this season with Gloria Vanderbilt’s SS10 ‘made to fit’ denim collection. Panels of hi-tech stretch denim reach across the hips, waist and bottom, smoothing out lumps and bumps and flattering the contours for a shapely silhouette. The range of styles available includes slim, skinny and boot cut fits. Gloria Vanderbilt denim is specifically targeted at the discerning, design conscious woman desiring the cachet of a designer label but also wanting a flattering, comfortable quality garment. The range is available both online and in stores nationwide. Sizes range from 10 – 20. Brandnation is an integrated marketing, PR and communications agency based in central London, specialising in multi-dimensional creative brand campaigns across fashion, sport, lifestyle and beauty sectors.